It must have been a few days into my adventure, or maybe time had alluded me. After all making your way through a diet of mainly intense punk, metal and electronic scream music your mind does start to play tricks on you. In the midst of this orchestra of noise and anxiety up popped Bartley Hinson and his album Jogging in the Sand. I sighed with delight, my heart flickered and my ears popped open. You see the discipline of my adventure is to listen without prejudice, but to listen to a ukulele Mr Hinson, you are surely testing me? The ukulele as a credible musical instrument has a dogged history in the UK. 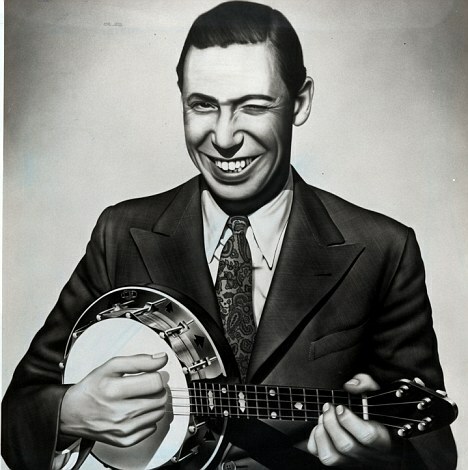 Principally associated with the institution that is George Formby (1904-1961) a British singer-songwriter, comedian and actor who sang light comical songs usually playing his ukulele/banjo. Formby was the highest paid entertainer of his time with songs like, ‘When I’m cleaning windows’ and the controversial ‘With my little stick of Blackpool rock’ which was banned by the BBC due to its suggestive lyrics. Formby and his wife travelled throughout the Second World War cheering the allied troops up by creating improvised songs to fit the situation. Formby – A very naughty boy. In a similar vain Bartley Hinson took a ukulele backpacking and ended up writing these songs and following a chance encounter with his old friend Devon Cole jump-started the recording of the songs and their release in October 2013. Jogging in the Sand consists of Bartley, lead vocals, ukulele, guitar, bass, organ, keyboard, percussion, kazoo and Devon Cole backing vocals, drums, percussion, guitar, synth. And impressively self recorded in a barn too. I caught up with Bartley via email exchange and asked him about the album and the influences behind the songs. Not only is this an accomplished album, but it comes from the heart and a level of honesty that is rare. In return I have learned to listen behind the notion of the UK ukulele syndrome thanks to Mr Hinson. Amongst the humour and fun of this album lay profound lyrics, which are not a million miles aways from the punk scene of my teenage years, but what really comes to mind upon reflection is The Who’s classic My Generation – I hope I die before I get old! Mr Hinson I Love this album. Buy it on Bandcamp for name your own price (don’t be a skinflint!). You can also find Bartley’s 2013 Strawberitas on the same Bandcamp page under the name Bird Machine (great name), strangely I could not hear much ukulele on this track?